There is always something small cities that make them such amazing places to live and work in. Edmond, OK is one such place thanks in large part to its abundance of amazing schools, beautiful parks, museums, and overall safe community. Its motto is "A Great Place to Grow", and anyone who has ever stepped foot here can easily attest to how great it is to start raising a family in this city. All in all, there are many fun things to do here, and you'd much rather spend your free time enjoying the city's attractions instead of doing yard work. That's what Lawn Love is here for because we want you to spend your days off from work doing things that make you happy. We have the best yard care service in Edmond as well as some of the most experienced independent lawn pros who have the tools to make your yard look great again. If you're looking for yard care service that will be worth your buck, then Lawn Love is the company you should go with. We also have an app and website that will help make booking and scheduling your yard care service look like the easiest thing to do in the world. 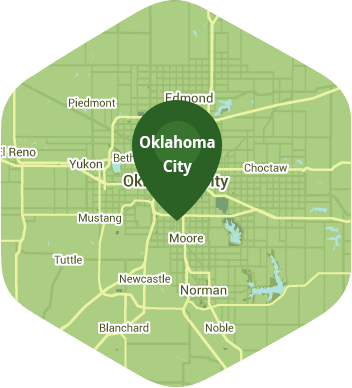 Get in touch with us at 405-926-8318, or ask for a free online quote. Rated 4.77 / 5 stars in 3,711 Edmond customer reviews. Dusk and dawn are the best times to water your lawn (the sun will rise at 6:50 AM and set at 8:07 PM today in Edmond). Average lawn size 8,018 sq. ft.